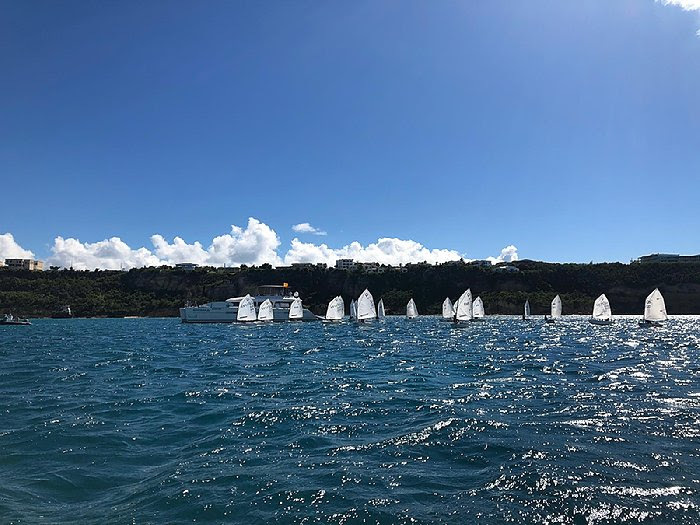 Last Saturday 14 youth sailors of the Sint Maarten Yacht Club Sailing School visited Anguilla to participate in the Anguilla Dinghy Championships in the Opti, Laser and 420 classes. The participants and their support crew crossed the Anguilla channel aboard luxury catamaran Enigma 3, who sponsored the boat to be used as committee boat for the day. 5 races were sailed in all classes, showing outstanding results for several Sint Maarten youth sailors. Emma Lennox and Caii Banting sailed consistently in the Optimist Gold fleet and secured 3rd and 4th place overall. St Barts sailors Antonin Sciou and Christophe MAXOR took 1st and 2nd place in this fleet. Justin Pieterse and Ajani Blake sailed against strong competition from St Barts in the Laser class and finished in 5th and 6th place. Lorenzo Mayer, Elio Boutin and Tristan Greaux came in 1st, 2nd and 3rd place. In the 420s Matthijs Detering and Jesse Lake sailed ahead of the fleet for most of the races and with 3 bullets took home 1st place in their class. Sahil Khatnani and Cansu Kilic sailed against strong competition from Anguilla, Ricardo Carty and John Baptiste, and took home 3rd place. The Opti Silver fleet saw 6 keen Sint Maarten youth sailors compete against talented sailors from St Barts and Anguilla. Lolie Osswald from St Barts won 1st place with 5 bullets and received the Best Girl Award. Second place was won by Jules Fortunati from St Barts and Omar Davis from Anguilla won third place. Adriaan Coppelmans from St Maarten won the Sportsmanship award. The Sint Maarten Yacht Club wishes to thank Neil Roebert of Enigma 3 for making his boat available as committee boat and transporting the sailors and equipment. In addition thanks goes out to the Anguilla Sailing Association for organizing the event, Paul and Deborah Miller for their race committee duties and Brad and Tara Taylor for providing their boat to bring over additional passengers and equipment.